JohnMasone.com - MenuLizard Mobile Exploding! A few weeks ago, I took the time to create a "small screen" friendly version of MenuLizard. I called it MenuLizard Mobile. Its much easier to use on a small screen than the full web site. Works great on iPhones, and even regular phones with a web browser, PDAs etc. Then, I found a bunch of small 'iPhone Directories", lists of 3rd party 'web apps' for the iPhone. So I submitted my app to all of those, and started to see hits from them. That was neat. Then Apple came a'knocking. So I submitted my site to Apple, and a few days later, they came out with their own web app directory for iPhone and iPod Touch. 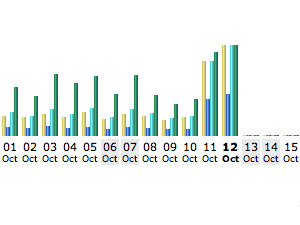 As you can see, in the first two days, my traffic is blowing up! This is excellent. Now, what I really really need is more menus. People used to get to my site via google, because I had what they are looking for. But with web app directories listing MenuLizard Mobile, now people are being 'sent' to me, and expecting to see all their local menus. Unless they live near me, they aren't finding this. So in conclusion, the explosion I knew was coming, is here. But if I don't grow and get LOTS more menus ASAP, I will become a victim of my own success. Too many people will be coming to me and NOT find what they are looking for. I need people to help the cause, instead of bitching about it.